Some people natural come to the defense of those who seem to be in need, but there are other people who feel like this is enabling. For some it is vital to speak out for those who seem to lack a voice, and they believe in doing their best to support those in need. 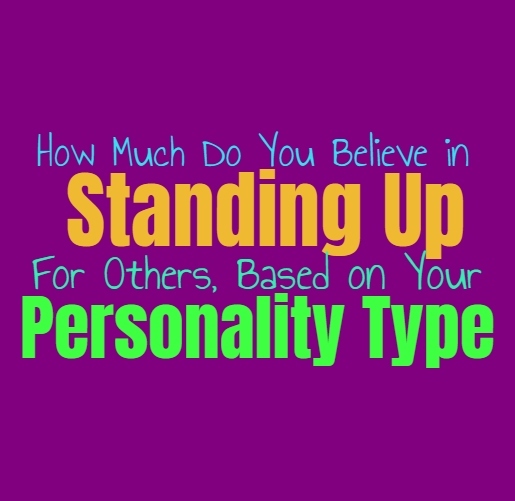 Here is how much you believe in standing up for others, based on your personality type. INFJs absolutely believe in coming to the defense of those in need, and will do their best to be their protector. When they see someone who seems weak and incapable of defending themselves, they want to be an advocate for that person. This is also what makes most INFJs very sensitive to animals and they often want to find ways to protect them from the harm of humans. INFJs care about others and they don’t feel right simply standing by and watching while they get trampled on by the cruel people of the world. ENFJs definitely believe in standing up for others, especially those who seem to be in need. ENFJs don’t like seeing anyone in pain and so they do their best to protect people who cannot seem to protect themselves. Sometimes they come to the aid of people who might not desire this, but ENFJs simply cannot help themselves. They care about people, even those they do not know, and want to find a way to ease their suffering. They are often advocates for animals as well, wanting to do what they can to lend a voice to those who cannot speak for themselves. INFPs might not be the most confrontational people but they really do believe in standing up for others who seem to be in need. They don’t like butting in where they don’t belong, and won’t simply help someone who is clearly not wanting it. But when the INFP witnesses someone who is being trampled on and really does need to be defended, they find it difficult to just stand back and watch. For them it is important to protect and defend those who need it, especially those who seem incapable of doing this for themselves. ENFPs can be protective people when they feel like it is the right and moral things to stand up for someone else. They don’t like just sitting back and watching bad things happen and believe in stepping in when they are able. ENFPs aren’t like the types to step in constantly, but they do this when it feels right in their hearts. They also believe in protecting those they care for, especially when that person asks for their help. ENFPs do believe in giving people a sense of independence, but at the same time they can see when help is needed. INTJs don’t believe in jumping in to defend people whenever they fall or make a mistake. Constantly jumping to protect and stand up for those around them, can sometimes seem like enabling for the INTJ. This doesn’t mean they cannot be very protective of their loved ones, especially when they see that they are in need. To the INTJ the best way to really help people is by doing their best to remove ignorance and help strengthen them by giving them information. Instead of always coming in to play the white knight, INTJs believe in educating people on how to take care of themselves. ENTJs don’t believe in always standing up for people when they should be able to do this for themselves. This doesn’t mean they cannot be protective, in truth they are especially defensive of their loved ones. ENTJs believe that it is important to teach others how to be strong so that they can stand up for themselves when the time comes. To the ENTJ it is not helpful to always play the white knight, especially in situations where someone should be able to defend themselves and remain firm in their beliefs. INTPs are independent people who often believe it is important to focus on their own business. Some people might seem to be in need of protection, and they can be rather defensive when they deeply care for someone. Most of the time INTPs feel it is important to give people space to take care of themselves, since they personally dislike when people constantly jump in and try to speak for them. INTPs might feel like constantly trying to stand up for people can actually be offensive to them, especially if they seem capable of overcoming things themselves. ENTPs are more likely to stand up for the people they love, simply because this is something which they do naturally. When it comes to strangers they might not know if it is the right thing to do, especially if that person seems capable of standing up for themselves. ENTPs don’t like taking away someone’s independence or making them feel like they are incapable of handling themselves. They are more than willing to help out, they just don’t like doing this unless they are asked to. ISTJs do believe in standing up for the people they love, and can be rather protective of them. When it comes to strangers they don’t always believe in stepping in, especially if they don’t feel like they belong in this situation. They do want to help people who ask for it, and are capable of stepping in and speaking up when it feels like the right thing to do. ISTJs simply don’t believe in coming to the defense of every person they meet, since it is important to give people a chance to stand up and speak up for themselves. ESTJs are protective of their loved ones and can become rather vicious towards anyone who tries to harm them. They don’t however, believe in coming to the aid of every single person who they meet. ESTJs feel like sometimes it is important to let people stand up for themselves, instead of enabling them and making them feel like someone else is always going to be there to help them. They value independence and would much rather teach people how to stand up for themselves than to simply do it for them. ISFJs do often find themselves wanting to stand up for others, mostly because they hate seeing pain and cruelty. They are likely to step in when someone is in need and want to do whatever they can to stand up for these people. For the ISFJ it is important to try and prevent people from hurting, since they are naturally compassionate people. They are very connected to the emotions of others and can often sense when someone really does need to be stood up for. ISTPs are very independent people, but that doesn’t mean they will not stand up for others when it seems right. The way the ISTP stands up for people is by lending their facts and information in order to educate. They believe in spreading the truth when they can and are more than happy to correct someone who is spreading inaccuracies. They can often come to someone’s defense when it seems another person is spewing lies in their direction, and they even enjoy doing this. ESTPs are very independent people who don’t believe in constantly trying to fight for everyone they meet. This does not mean they are incapable of standing up for others, since they will do this for those they love. ESTPs don’t believe in trying to protect everyone, instead they believe in spreading the truth and trying to educate people. They often seek to help people by showing them how to help themselves, and by providing them with useful information which can make them feel more empowered. ISFPs do care about people and they dislike seeing anyone victimized. When someone clearly needs to be stood up for, the ISFP wants to do what they can to support them. They might not always know exactly what to do, but they definitely believe in trying their best to do the right thing. Sometimes the ISFP simply believes in befriending this person who is in need, so that they can show them support and be there for them. ESFPs do believe in standing up for their loved ones and for people who seem to be in need. They have big hearts and really want to do whatever they can to support people, especially when they feel personally connected to them. For the ESFP being able to stand up for those who cannot seem to stand up for themselves, feels like a truly valuable accomplishment. While they might be focused on being positive and seeking out excitement, ESFPs do care about others deeply.